Retired adults are not usually targets for high-tech products. Built around teenagers and young adults, the iPhone and Android app market is flooded with games and social media programs for those generations. However, many apps—even those designed for any age group—aid the lives of older adults and give them helpful tools for making everyday life easier. Here is a list of the top eighteen innovative apps for seniors in 2019. Parking lots can be confusing, and trying to locate your car among hundreds of other vehicles frustrates even the most patient driver, young or old. Car Finder AR helps you remember where you parked your car and uses augmented reality and 3D Google Maps to find your parking spot. Not on Andriod? Try the app Anchor Pointer Compass GPS for finding your vehicle. 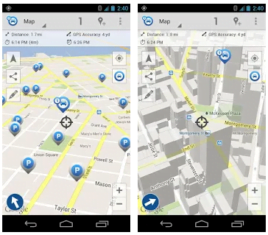 The app uses the GPS from your phone to give you walking directions back to your vehicle. The aging process often affects memory, frustrating seniors who make great efforts to stay mentally active. Keep your mind sharp with this clever memory-improvement app that contains hundreds of games and puzzles. Designed by neuroscientists, Lumosity is proven to benefit memory recall and information retention. Listen to any music genre with Pandora’s customizable stations. Improve your stations by “upvoting” or “downvoting” each song selection. Periodic commercial breaks allow users to listen to Pandora channels free of charge. For $3.99 per month, subscribers listen to their music without commercial interruption. Pandora is a great way for music lovers to explore every genre of music. Making international and long-distance calls adds up, costing you hundreds of dollars to stay in touch with your family. 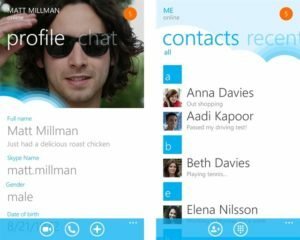 Skype users are able to make long-distance calls, send instant message, and enjoy video conferencing for a fraction of the price. Call or video chat to mobile phones and landlines for a small fee. You can even video chat over wireless Internet free of charge. Save money and connect with family members all over the world using this popular video communication app. Never let weather surprise you again. Get constant updates on the day’s weather and what to expect in the forecast. Mobile alerts let you know if your forecast predicts severe weather, giving you ample time to get indoors before an approaching storm. WebMD offers physician-reviewed health content and constantly updated information about maintaining a nutritious lifestyle. The “Healthy Target” section lets you establish goals for your eating and exercise habits and then gives actionable insights at the end of each week. Enter your symptoms and find possible causes on the app, as well as common treatments for the diagnoses. While WebMD cannot take the place of your general practice physician, the app is a great resource for sustaining a healthy diet and routine. The Pillboxie app reminds you to take medications at the scheduled times you set. Customize your medications by color and drag them into the sectioned pillbox graphic to easily organize your prescription schedule. This useful app ensures you will never again forget to take your daily medications. 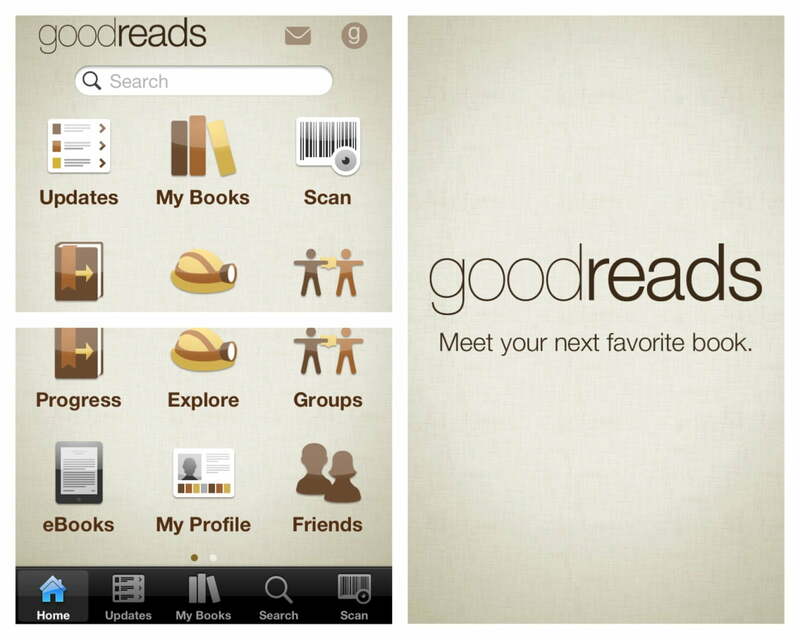 Discover and share your favorite books on the Goodreads app. Recommended by 20 million members, this app allows users to rate their recently read books and give brief explanations of their choices. View other users’ reading history to see how often they read and their typical genre to find out if you share mutual interests. 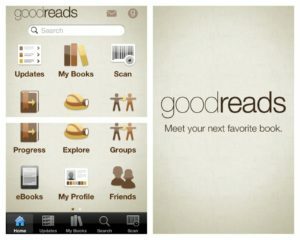 With Goodreads, you do not have to purchase a book based solely on its cover. Like the name implies, Find My iPhone helps you find your missing device, while also protecting the data stored on your phone in case of theft. Sign in with your Apple ID and you can remotely lock the device, display messages to whoever has your phone, play sounds, and even erase the device completely. Find My iPhone safeguards your cell phone and protects your personal information in case your phone is stolen. As the name indicates, this simple app permits operators with less than perfect eyesight to zoom in and turn on the flashlight for ease of reading. This app is perfect for reading small menus, small print on mailers, or even small keypads. This app contains more than 30,000 recipes that have been carefully compiled from quality cooking sites. Epicurious offers reviews, tips, and pictures shared from other users for each recipe. Sync your shopping list for quick retrieval at the grocery store and organize favorite recipes on this cooking app. Epicurious lets you browse by holiday and even go hands-free using a voice control function titled “Cook Mode”. This recipe-packed tool combines many valuable capabilities into one seamless app. 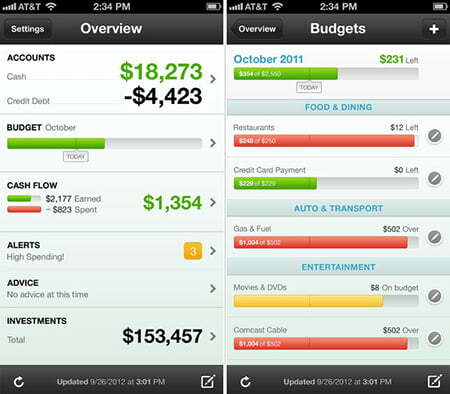 Mint is a personal finance app that lets users sync all bank accounts into one clean interface. Set budgets and alerts that let you know when you have gone over your designated spending limits. The app also has charts to show what percentages you spend on categories like groceries, restaurants, gas, and entertainment. 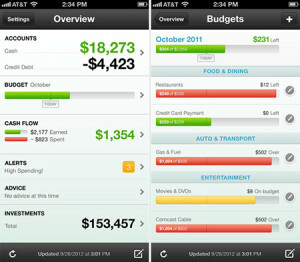 By segmenting spending habits, users take control of their finances and make savings goals. Track your blood pressure and weight over time without having to call your doctor or comb through old records. The Blood Pressure Monitor app provides statistical information, periodic health reminders, and allows you to export data so you can share it with your personal health-care provider. This tool is a great way for seniors to oversee their health regimen and stay in shape. These apps work with the Google Home and Amazon Echo products around the home. Control smart devices, play music, listen to the news, call friends and family, or even place Amazon orders just using your voice. Though you can control the Google Home and Amazon Echo products through these apps, once they are set up on the phone, you can perform many actions just using your voice. Seniors who have trouble viewing small text on phone screens will find these apps particularly helpful. If you would like to use your Apple devices for reading instead of investing in a separate device like the Kindle or Nook, the iBooks app is perfect for you. The iBooks app downloads books directly from the iTunes store and then syncs them to your cloud, where you can read them on any of your Apple devices. Get worldwide news and listen to your favorite NPR programs on the go. Users can search the NPR archives to listen to interviews from previous years. The NPR app gives older adults their world news and relevant stories in a concise and easy-to-use app. Stream hundreds of television shows, movies, and documentaries on the Netflix app. 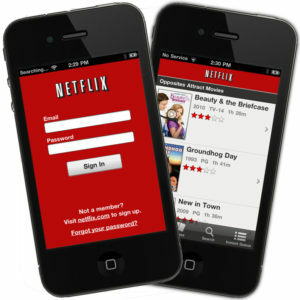 A subscription starts at only $7.99 a month and includes unlimited streaming. Seniors will find this app useful during workouts or when traveling to provide hours of entertainment. An app designed with an older generation in mind, Simple Social is a cleaner, less-cluttered version of the classic Facebook app that now also allows integration with Twitter. Older adults are able to browse effortlessly through the app without investing long hours to learn how to navigate the interface.As a bonus, this simple app reduces the amount of battery power necessary to access your social media accounts from a mobile device! Keep in touch with friends and family members with the Simple Social app. These eighteen ingenious apps are designed with aging adults in mind and can simplify and enhance your life. Use these apps to transform cutting-edge technologies into easily accessible tools for everyday chores, social experiences, and entertainment.